THE Pre-Brexit general election has been blamed for yet another delay to the release of British classified UFO files that the Ministry of Defence (MoD) appears reluctant to let go of. 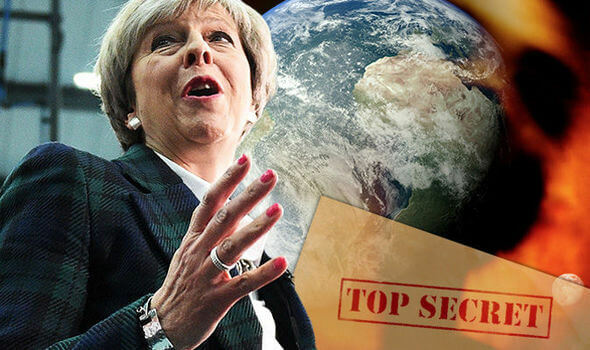 Conspiracy theorists claim the Government is stalling and using any excuse to stop the release of the files as they may contain a smoking gun piece of evidence about alien visitations of Earth. Last year the 18 files were sent to the National Archives for release to the public, but then mysteriously sent back to the MoD for further censure. The latest release date was set to be this March, but, again they failed to materialise. Now, the National Archives has blamed the upcoming general election – called to give Theresa May a mandate for Brexit – for further delays, according to Grenzwissenschaft-Aktuell.de. They are believed to date from 1971-76 and 1996-2000, and 2004. It is also hoped there are further files from the December 1980 Rendlesham Forest UFO incident that will shed more light on the bizarre case, when US military officer claim to have seen a UFO land. A National Archives spokesman spoke to the German frontier science and the paranormal news blog. He said: “Due to the upcoming election here in the UK and the rules relating to government departments during the pre-election period, the files will not be released until after the election. In 2013, the MoD claimed to have released all of its UFO related formerly classified files, after beginning declassification in 2008, but it later emerged in 2014 it had held back the 18 still to be released. A series of promised dates have come and gone, leading to speculation about what they must contain. In a blog about the delay, Andreas Müller, editor of Grenzwissenschaft-Aktuell.de, wrote: “Since it became known in Autumn of 2014 that contrary to the claim that the British Ministry of Defence (MoD) has released all of its formerly secret UFO-files already back in 2013, still 18 files of the MoD’s former UFO-Bureau files were held back. “UFO-researches as well as historians look forward to the release of those files, that has been postponed repeatedly since then. Nick Pope, who was formerly employed by the MoD to investigate the UFO phenomenon, until 2009, told Express.co.uk: “As a former civil servant I understand the reasons for this, but the UFO community will doubtless be suspicious of this latest delay. “When I made the official announcement of the declassification and release of these UFO files in May 2008, the thinking was the the release project would take two or three years. “Now, over nine years later, I understand people’s frustration and can see why this delay is generating conspiracy theories.